Hello again fellow scrappers! Today I'm presenting a page that I made for the latest C.S.I Challenge. I'm also entering this into the Berry71bleu mixed media challenge going on during this month. Similar to my 'She Gave Me Wings' page, I once again ended up using several mixed media to achieve the texture you see in my background. 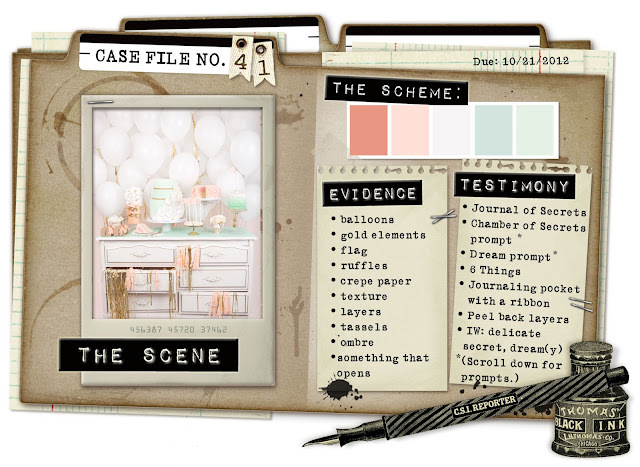 I had actually made this page previously but have been wanting to remake it for some time now since my scrapbooking style has evolved so much during this past year or so. I was amazed myself when I saw how different my style is today than it was about 2 years ago. 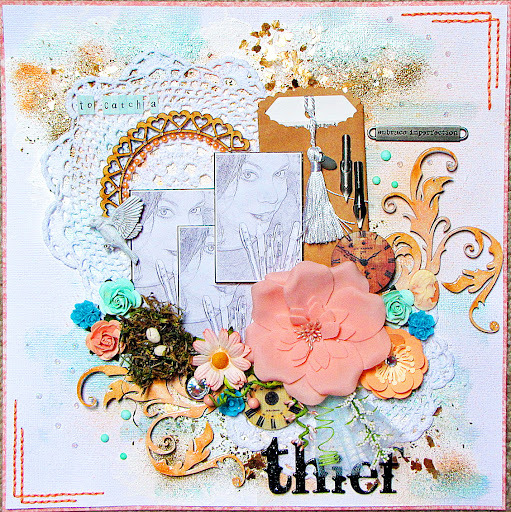 When I first started scrapbooking I kept it safe & simple. Now, I'm definitely more diverse & take more risks. I also tend to make my own backgrounds with either stamps or with the use of mixed media. Pens...I buy them, I collect them & yes, I unintentionally steal them. There isn't one cube in my office that I haven't hit. They are left carelessly thrown on top of desks & on shelves. When I visit, I tend to pick these pens up & play with them in my hands while I talk shop. When I walk out of the cube--the pen is still in my hand. It eventually lands into one of the 3 mugs I have on my desk that I use to hold all of my pens. Sometimes, the pen makes it's way back to it's original owner--but most of the time it stays with me & added to my always-growing collection both in the office & at home. Here's the C.S.I Case File that I based my page on. The chippies are by the Dusty Attic. I added a couple of elements to these guys as well in order to give them a bit of texture. I started off by painting them with gesso--once dry I randomly spread Peachy Keen Shimmerz paint & Sunkissed Peach glimmer mist all along my chippies with a thin paint brush. I then hit my chippies with my heat gun. Finally, I added Glossy Accents by Ranger to my chippies to give them that epoxy look. I used a couple of pen nibs by Tim Holtz to convey the theme of my page. You can see my tag & journaling peeking out from it's pocket here. The tassel is used to pull the tag out of it's pocket. I edited my photo with Photoshop. I felt that turning my photo into a 'pencil sketch' went along with the theme of this page as well. The doilies I bought from JoAnne's Fabric store. Resin bird is by Prima. The metal plate is by Tim Holtz & I felt the statement fit this page perfectly. 'Embrace Imperfection'. Lord knows I'm anything but perfect & have several bad habits such as this one! I also randomly added dots of Crystal Ice Stickles & mint rhinestones to my background. You can find them scattered around here and there. Large rhinestone button is by Zeus & Zoe. To give my background some texture I started off with randomly spreading gesso with a sponge. While the gesso was still wet, I applied the following: gold embossing powder by Stampendous, Dried Marigold & Spiced Marmalade distress embossing powder, gold chunky leaf glitter by Martha Stewart & Gilded Mica fragments by Stampendous. I then hit the entire background with my heat gun in order to melt the embossing powders. Once my background was dry I randomly spritzed some Sunkissed Peach glimmer mist & wrapped it all up by randomly spreading some Frosty's Got The Blues Shimmerz paint. Phew...all that for one background! The large light peach flower is by Manor House Creations. Wooden clocks are by Prima. Thanks to all of you who stop by for a visit. Have a great weekend everybody! wow Kay...this is stunning and your attention to detail is out of this world! Stopping by from Flickr group. Am now a follower. I love your style and am now defining mine too. Cool to see others do the same! What a charming layout - full of glorious detail~! thanks so much for playing along again at Berry71Bleu!